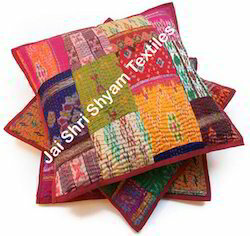 We are prominent manufacturer and exporter of Silk Patola Cushion Pillow. They are hypo allergic, hygienic and odorlessThese are available in beautiful designs and at reasonable prices for our patrons. We offer beautiful handcrafted silk cushions that adds an ethnic 'khadi' touch to the decor. They are available in a whole variety of earthy colours and patterns that add to the aesthetic value of the interior. According to the exact demands of the clients, we are into providing a huge array of Printed Silk Cushion. Our professionals design these cushions as per the latest trend and desires of the customers. Our Printed Silk Cushion is widely used for decoration purpose due to its elegant look and beautiful design. Offering wider variety to our clients, we are specialized in the manufacture of an alluring range of cushions that are available in silk-on-silk combination. These cushions are beautified with fine resham work that is skillfully and meticulously done by our talented craftsmen. We provide Poly Silk Woven Cushion With Sequence Work to our clients. : 80cm x 60cm / 31" x 23"